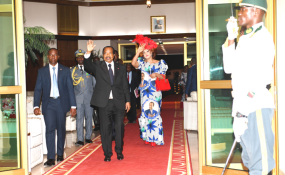 Cameroon President Paul Biya and his wife Chantal return to Yaounde after an election campaign visit to Maroua on 29 September 2018. President Biya is starting his new term at a time when the crisis in the two English-speaking regions of the country is worsening by the day. Living in these two regions has become a nightmare for many residents. Last week an American Baptist missionary was shot and killed, allegedly by stray bullets. A few days ago, a teacher in the town of Tiko in the South-west Region of the country had his fingers chopped off, while more than 70 students in a boarding school of the North-west regional capital of Bamenda were abducted. Both acts were allegedly carried out by the separatist forces. However, the leaders of the separatist movement have denounced the acts, saying attempts to hold them responsible were a ploy by the government to sabotage the movement. Government forces have equally been accused by rights groups of extrajudicial killings, torture and burning down villages. During his 36 years in power, President Biya has recorded modest accomplishments in some areas of national life, especially in the areas of infrastructure and education. When he first took office, Paul Biya promised he would be remembered as the president who brought democracy to Cameroon. In subsequent elections, he did allow more choice of candidates within the one-party system. A decision that earned him praise and respect nationwide and filled Cameroonians with hope. However, this hope soon faded as his rule became more and more authoritarian and the economy declined considerably. Despite Biya's achievements in the political, economic and social sectors, his 36-year-old-rule is characterized by corruption, bribery and nepotism which has become the rule rather than the exception. Cameroon's democracy is made up of very weak institutions, all under the control and influence of the president. The country's constitution is created to serve the interests of the president and not those of the people. Biya inherited a booming economy, but today it is stagnating, due largely to mismanagement and the embezzlement of state funds by top government officials. Cameroon is ranked 150th on the 2011 Human Development Index, and it is estimated that about 50 percent of the population live below the poverty line. The educational system is porous and many university graduates are engaged in menial jobs like motor taxi riders and call box operators. The right to good quality education is limited. Dilapidated schools abandoned by the government are a common sight. Freedom of speech and expression are stifled.The suppression of peaceful protests and imprisonment of political opponents are common. Amnesty International has recorded numerous instances of illegal arrests, torture and death at the hands of the Cameroonian military. His dismal record and dwindling popularity notwithstanding, Paul Biya has managed to consolidate his position in power for 36 years and counting. Several factors account for this. First, his control of and influence on political institutions like parliament, the judiciary, the Constitutional Council and the body in charge of elections. He uses these institutions to suit his whims and caprices rather than for the interest of the country. For example, 99.9 percent of laws passed in parliament come from the president. Second, the politicization of the civil service and other areas of public life have also helped Biya to consolidate his position in power. Appointments in the civil service are not based on merit but on loyalty to the party in power. The provision of basic services like roads, water and electricity has become conditional on the support of the president and his party. People's minds have been conditioned to believe that unless the president's party wins in their locality, they won't benefit from developmental projects nor will their sons or daughters be appointed in the public service. In addition, the Cameroonian opposition is weak, fragmented and lacks coordinated efforts. The opposition spend their time fighting each other rather than doing what they are supposed to do - check government actions. Finally, the citizenry is docile and easily manipulated. Frustrated by the series of electoral fraud over the years, most Cameroonians don't believe change can come from the ballot box. Many have decided to throw in the towel and decided to join "The Winning Team" in order to benefit from the regime. Others are simply waiting for divine intervention.